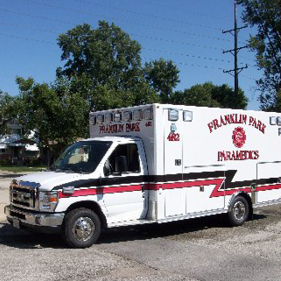 The Franklin Park Fire Department will transport to several local area hospitals if requested. As always, any decision to transport a patient to any hospital other than the closest facility is always based on our resource hospital and the condition of the patient. But our primary hospitals are Gottlieb, Elmhurst, and Loyola. Cardiopulmonary resuscitation (CPR) is a lifesaving skill that requires no equipment, a little commonsense knowledge, and the willingness to get involved with a person who may die without intervention. There have been many changes in the skill of CPR since its introduction many decades ago. The Franklin Park Fire Department maintains a group of instructors that keep our firefighters and paramedics up to date in the latest CPR techniques. Classes are also offered to various organizations and the public by the Franklin Park Fire Department at convenient times and are reasonably priced. These classes serve the public-at-large, health care professionals and workers that require certification as a condition of employment. For more information, please contact our EMS Coordinator. The Franklin Park Fire Department provides first aid to the public at very reasonable rates and accommodating class times. First Aid classes follow the American Red Cross training curriculum that is standardized across the United States. Local industry, park districts, medical/dental office staff and school personnel are but few that have taken advantage of our first-aid program. Each program can be tailored to the needs of the individual group. All classes include information on the care of victims of trauma and medical emergencies. Basic CPR, bleeding control and victim management skills are emphasized. Automatic external defibrillation skills can be added to any of the first aid classes.